Flagstaff, Ariz. • The patriarch of the polygamous family from TV’s “Sister Wives” drove around his new hometown in northern Arizona, admiring the mountain views but still thinking about the heap of boxes that needed sorting at the homes he rented for his four wives and 18 children. Producers told city officials the TV show will do most of the filming at the homes and in a commercial building space the Browns rented. Season eight of “Sister Wives” is set to debut on TLC in January. 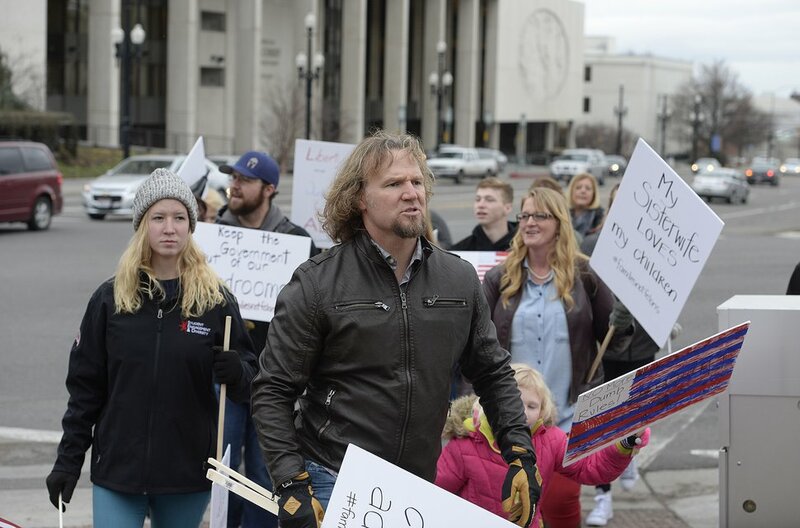 Scott Sommerdorf | The Salt Lake Tribune Polygamist Kody Brown and his family marched across State Street near the LDS Church Office Building in order to meet up with other polygamists and supporters before marching to the Capitol where they held a rally, Friday, Feb. 10, 2017. The family doesn’t regret its time in Nevada, where the kids blossomed because they could be normal and not singled out as polygamous kids as they would be in Utah, the wives said. They now range in age from 2 to 24.